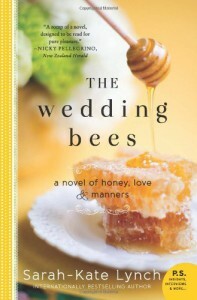 As Leah at Books Speak Volumes once described a book, starting The Wedding Bees was like sinking into a warm bath. The writing is just so beautiful! It’s lovely, warm, vivid, charming – perfect for the story of a Southern girl like Sugar. When I first read a post by Kayla at The Thousand Lives, I didn’t get what she meant about wanting authors to write with more color. Since then, I’ve read several books, including this one, where the author describes things using more color. And I love it! The addition of more colors to the descriptions gave the places she described a vibrancy that brought them to life. I also loved the dialogue, which was cute and funny, but not unbelievable. Sugar is almost unbelievably sweet and positive, but I couldn’t help falling in love with her right away.